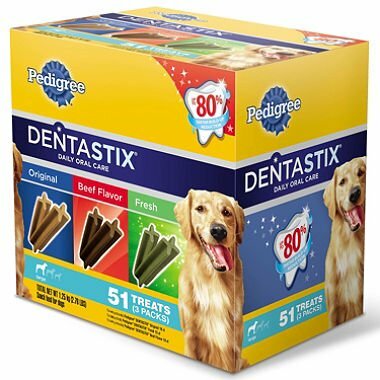 Pedigree DENTASTIX is clinically proven to reduce up to 80% of all tartar build-up when used as part of a daily oral care routine. With a patented X-shape, DENTASTIX work to clean plaque and tartar between teeth and down to the gum line. Developed using research from the Waltham Centre for Pet Nutrition, dogs love the great taste of DENTASTIX, easy-to-feed daily treats that are clinically proven to reduce tartar buildup.